European diplomacy, science-based policy advice and political commitment made the 2030 Agenda for Sustainable Development and also the Paris Agreement possible. In implementing the 2030 Agenda, besides maintaining an evidence-based approach, greater legitimacy of other types of knowledge needs to be ensured. To this end, the interface between science, policy and society needs rethinking. This was concluded at the 25th Annual Conference of the European European Environment and Sustainable Development Advisory Councils (EEAC) on 12 October 2017 in Maastricht, The Netherlands. The conference took place exactly 25 years after the Maastricht Treaty was signed. Europe can look back on 25 years of successful environmental and sustainable development policy-making. However, there is no reason to be complacent: we face obstacles and challenges in all dimensions of sustainability that define a complex and uncertain future for all. Looking at the 2030 Agenda for Sustainable Development, in particular, there are concerns about the ongoing dramatic loss of biodiversity, the risks of climate change associated with the current emissions pathways, the availability and quality of water and the lack of progress towards greater social equality and more sustainable financial systems. Message from Maastricht: how to drive forward the 2030 Agenda in a changing political and societal atmosphere? 25 years after signing the Maastricht Treaty, we are also witnessing a changing political and societal atmosphere. Established forms of scientific expertise and policy advice are more frequently challenged by critical citizens or even by the government institutions themselves. How can we drive forward the 2030 Agenda, given this changing link between science and policy? With the message from Maastricht, the EEAC and the national member councils address the European Commission, responsible for the implementation of the 2030 Agenda (17 SDGs). In environmental and sustainable policy a shift is taking place from top-down regulation to governance in networks. The EEAC and her national member councils, often consisting of both scientists en practioners, are well-equiped to follow this change and work beyond borders, silos and institutional barriers. The councils are ready to keep playing their role in advising on environmental and sustainablity issues. The implementation of the policy commitments for sustainable development requires not only strong evidence base, but also increasingly acknowledging experience coming from society: citizens, business and local communities. One way to maintain an evidence-based approach while at the same time ensuring greater legitimacy of knowledge is to re-think the interfaces between science and policy. The councils are committed to applying e.g. more transparent approaches to policy advice, more co-creation between scientists, policy-makers and citizens, new types of institutions to handle these co-creations (e.g. platforms such as IPCC and IPBES), co-regulation (e.g. round tables), and methodologies in which citizens themselves conduct research or contribute to scientific evidence. In a similar vein, the implementation of the Sustainable Development Goals (SDGs) requires inclusive, effective and accountable institutions. Renewed and shared inspiration is needed for European cooperation that goes beyond borders, silos and institutional barriers in order to drive forward the 2030 Agenda. Circular economy, water, food and land use, sustainable finance and energy & climate are amongst the most challenging issues in the light of the 2030 Agenda. Therefore, these issues are priorities on the research agenda of the member councils of the EEAC. The Dutch Council for the Environment and Infrastructure (Rli) organised this EEAC conference in association with the Environmental and Nature Council of Flanders (MINA), the Belgian Federal Council for Sustainable Development (FRDO-CFDD), and the Luxembourg National Council for Sustainable Development (CSDD). To request interviews please contact Rli Communications Advisor Ms Miep Eisner, e-mail miep.eisner@rli.nl, telephone +31 6 15 36 93 39. 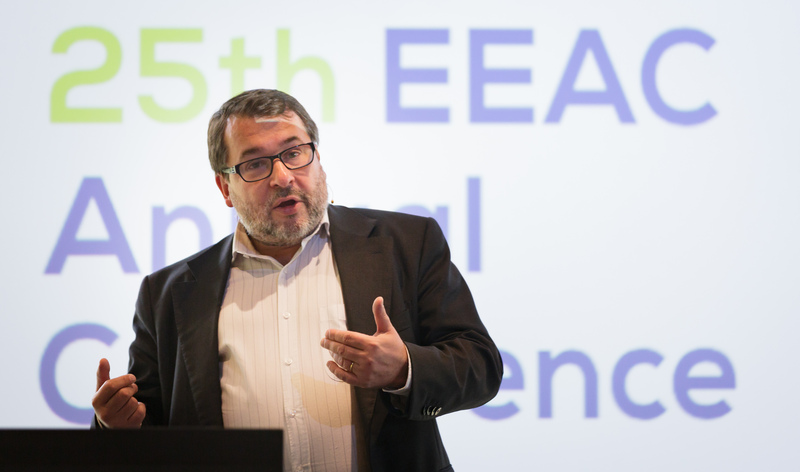 The European Environment and Sustainable Development Advisory Councils (EEAC) is a network of advisory bodies established by national or regional governments. EEAC members offer independent advice to their respective national or regional governments and parliaments related to the environment and sustainable development. The Council for the Environment and Infrastructure (Raad voor de leefomgeving en infrastructuur, (Rli) advises the Dutch government and Parliament on strategic issues concerning the sustainable development of the living and working environment. The Council is independent, and offers solicited and unsolicited advice on long-term issues of strategic importance to the Netherlands. The Rli is chaired by J.J. de Graeff.